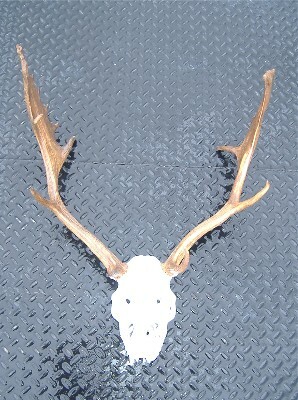 The lengths of the antlers off this Fallow Skull measure 20 6/8 (right) and 22 2/8 (left). The greatest inside main beam spread is 20 2/8". Least circumference between points one and two is 2 7/8" (right) and 3" (left). Greatest width of palm excluding points is 3 4/8" (right) and 5 1/8" (left).